Ten days ago, I attended the Northeastern meeting of the International Studies Association to give a paper. Afterward, I stayed long enough to attend one more panel. I chose one on gender because I knew I would be writing about its role in peacebuilding in my textbook sometime in the next few weeks. It was a great choice because a number of the presentation forced me to (re)think about the role of gender in international relations in general and how we peacebuilders have (and haven’t) dealt with it. Three issues stood out, all of which will appear in expanded form in the book. I had already assumed that Doug and I would have to cover the UN Security Council’s Resolution 1325 even before I heard Carly Rasiewicz’s presenation on her PhD research. Adopted in 2000, this little known policy calls on the world’s countries to adopt a “gender perspective” that considers the impact of conflict on women and girls. To be sure, 1325 and the plans it spawned were largely symbolic acts that have not yet had a significant impact on the ways conflicts around the world unfold or are settled. Still, they have at least put gender issues on the agenda, have led to some training, and had some impact in some places. For example, consider the work of my colleague, Sahana Dharmapuri and her group, The Gender Advisor. Many of the panelists also referred to the creation of feminist foreign policies. The first one was introduced in Sweden in 2014. Canada followed suit in 2018. Both foreign policies revolve around what the Swedes call 3R’s—Rights, Representation, and Resources. Both call for shifts in their countries’ policies in which gender issues (including their impact on men) are considered from beginning to end of any project. We should not make too much of these initiatives either, since even fewer countries have one, and it is by no means clear how effective they have been vis-à-vis traditional foreign policy goals. Still, their creation marks an important step. 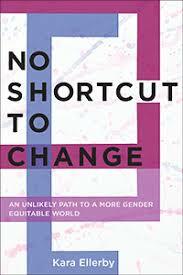 By far the most interesting and thought provoking ideas raised at the session came from Kara Ellerby who went beyond the themes covered in her recent book, No Shortcut to Change which I have reviewed elsewhere. In it and her presentation, she put a new and important twist on the feminist notion of intersectionality, which, while listening to her, I realized applies to just about any field that crosses traditional disciplinary lines, including my own. First used by Kimberlé Crenshaw almost thirty years ago, intersectionality refers to the way overlapping systems of power affect women’s lives. However, as Crenshaw, Ellerby, and others have argued, it’s not just women. Those same dynamics affect the entirety of all of our lives—hence the term intersectionality. Even more importantly for my purposes, Ellerby’s presentation also focused on the ways once radical-sounding ideas like intersectionality can come to (re)shape conventional social and political discourse. As she put it, until recently, we thought about gender-friendly policies as reflecting the kinds of ideas in 1325 or the new Swedish policies that affect women directly through, as she puts it, add gender and mix. As she points out, those kinds of policies can only take us so far. The same holds for policies that just address peace building. In short, intersectionality matters to us all.